HOLLYWOOD, Calif., Nov. 8, 2018 /PRNewswire/ -- 2018 marks the third consecutive year that Battery, a Los Angeles based advertising agency, has been ranked as one of LA County's fastest growing private companies according to the latest list published by the Los Angeles Business Journal. Battery joins the select ranks of independent companies that have consistently outgrown expectations in 2018, 2017 and 2016. 2018 has been a year of tremendous growth for Battery working with such remarkable brands as Netflix , Activision Blizzard and Disney. This year, Battery has been recognized across the marketing industry as one of Ad Age's Small Agencies of the Year, ThinkLA's Boutique Agency of the Year along with many creative awards including Cannes Lions, CLIOs and a D & AD Pencil. 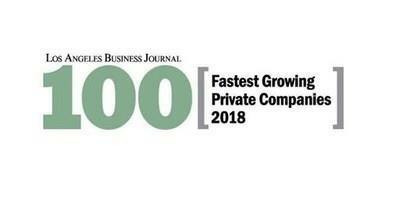 LABJ is the leading source of news and intelligence for the Los Angeles business community, and the 100 Fastest Growing Private Companies rankings salutes the highest performing business in the region. Each week, the award-winning LABJ examines the many ways that the L.A. economy operates. First-rate editorial and research teams provide in-depth analyses of the community's dynamic business and economic scene. Battery's mission is to create advertising that is as sought-after as entertainment. Honored as an Ad Age Small Agency of the Year in 2015, 2016, and 2018, Battery creates global award-winning campaigns for such brands as Netflix, AECOM and Activision Blizzard. More information can be found at www.batteryagency.com , or follow them on Facebook, Twitter, Instagram & Youtube.